The New York Sun may be folding next month. The paper, no relation to the London Sun, was one of the papers in which former Telegraph boss Conrad Black had an interest. It was launched six years ago, just after the terrorist attacks on New York’s World Trade Centre. One of the few non-giveaway papers to be launched in the US in recent years it took its name from an old time New York newspaper that folded many years ago. It became popular among New Yorkers looking for alternative to the NY Times and provided wide daily coverage of politics, arts and culture. But it lost money – in the region of a million dollars a month. 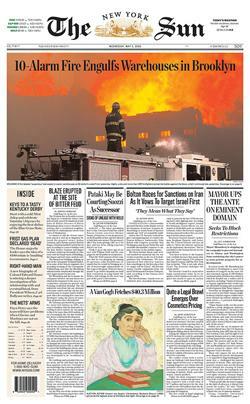 Editor Seth Lipsky warned in a front page “letter to readers” that the paper was at a crossroads. Unless more financing is upcoming The Sun will fold at the end of next month. The chances? “I am hopeful”, said Lipsky. The original backers, who put in around $20 million, included Hollinger International when it was headed by Black. Subsequently a new team of backers headed by Tom Tisch, son of billionaire Laurence Tisch put up another $30 million – but now that financial well is now apparently running dry.